The Offset Cam Clamp are constructed from ¼” thick aluminum. The overall length of the clamp is 5” with the handle itself being about 3” long. This handle provides the leverage needed to tighten the clamp. The oval cam itself has a radius from 5/8” up to 1.125” providing a clamping range of 0.5”. The clamps are provided in sets of 2 – one left hand and one right hand. The holes for the screws are countersunk so that the head of the screw does not protrude above the surface of the cam. Two ¼” 20 TPI x 5/8” long screws are included with the set of two clamps. 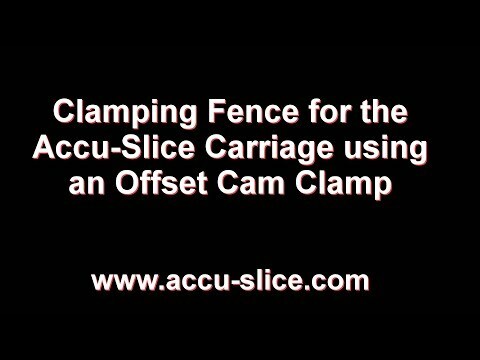 The Offset Cam Clamps were originally designed for a clamping sacrificial fence for the Accu-Slice system as shown in several of our videos. This permits material to be quickly clamped to the sacrificial fence for cutting without the need for a double-sided table or other means of attachment. 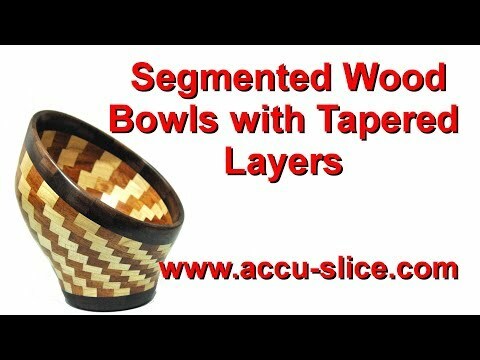 Our video on making the angled segmented rings demonstrates the practical application of these clamps. The clamps can also be used for custom jigs for the holding of material for cutting, carving, sanding, drilling or other applications where it would be helpful to hold an object for quick clamping and quick releasing. The Offset Cam Clamps are designed to be attache to a surface with a 1/4" 20 tpi screw. The board or mounting surface for your project can have these threads tapped directly into the surface or you can attach them via other mounting systems such as the Brass Screw inserts or our new Offset Camp Sliding T-Channel Mounting System. 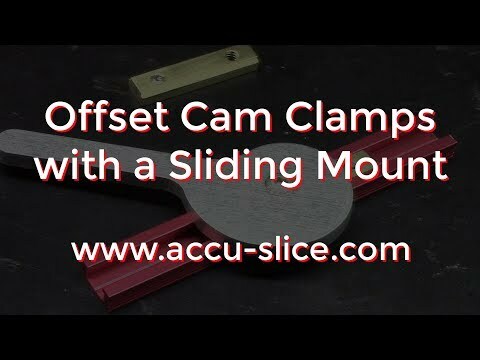 The Offset Cam Sliding Mounting System was developed by Accu-Slice to enable the adjustment of the Offset Cam Clamp to a set position on your board surface quickly and easily. When the Offset Cam system was initially developed, it used the brass screw inserts to attach the Offset Cam Clamps to the board surface. However, since the Offset Cam Clamps only have a clamping range of half an inch (0.5"), this means that you would need a lot of the brass screw inserts to enable a wide rang of clamping positions. However, these brass screw inserts do work quite well for mounting the Offset Cam Clamps. The Offset Cam Sliding Mounting System enables you to set the position of the Offset Cam Clamp at any position along a T-Slot Channel. This provides a more accurate and versatile positioning of the Offset Cam Clamps on your working surface. The Offset Cam Sliding Mounting system consists of a Brass Sliding Key and a section T-Slot Channel. The Brass Sliding Key is 2" long and contains two tapped holes: one for the Offset Cam Clamp and a second for the set screw. The Brass Sliding Key is machined to snuggly fit into the T-Slot Channel and slides smoothly along the channel. When the position of the Offset Cam Clamp is determined, the set screw is used to lock it in place. We recommend that the T-Slot Channels be mounted to a 3/4" thick piece of MDF. A dado 3/4" wide by 3/8" deep should be cut into the MDF board to mount the channel. The T-Slot Channel can be cut to any length desired and should then be glued into the channel in the MDF board. Note: The Brass Sliding Keys are precision machined to snugly fit the T-Slot Channels that we provide. They will probably not fit in other manufacturers' T-Slot Channels since the dimensions my have different measurements on the inside of these channels. The Brass Screw Inserts are designed to screw into MDF or plywood boards to give you better holding power for smaller screws. To use these inserts either a hole 3/8" or preferably a 13/32" is drilled into your board and then these inserts are screwed into those holes. These inserts then accept 1/4" x 20 tpi screws. In the past we have used many of these Brass Screw Inserts for attaching the Offset Cam Clamps to MDF boards on the Accu-Slice System. The Offset Cam Clamp Set contains 4 of the Offset Cam Clamps and the components needed to adapt the Offset Cam Clamps for your application or custom jigs. The Offset Cam Clamps can be mounted to your jigs using the brass sliding mounting assembly which slides in the T-Slot Channel. Or you can use the brass screw inserts to attach the Offset Cam Clamps directly to your jigs. 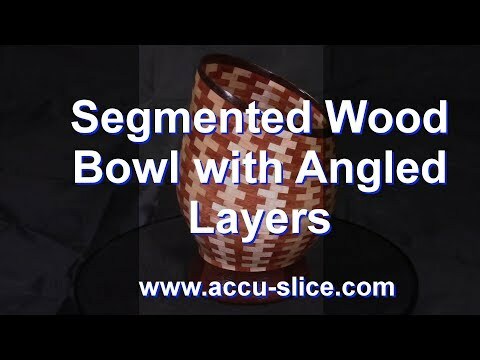 This system can be used to produce the jigs shown in our videos as well as special applications you may need for your special projects. For applications see our videos that are listed.